Stand Up Paddling, or SUP, has grown in popularity in the past year. SUP is a hybrid of surfing and canoe paddling. The equipment used for SUP is just as unique as the sport itself and is done using an extra large surfboard and long paddle. Exclusive lessons for a group of family or friends. Up to five people per instructor. A minimum of 2 guests must sign up. One hour lesson with surf instructor. 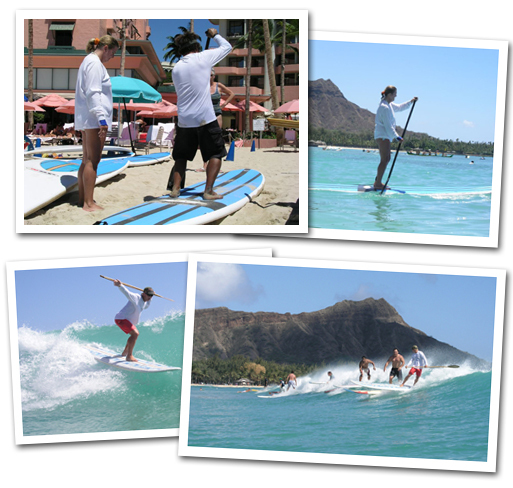 Catch waves on your SUP board! A physically demanding class. For those who have mastered the beginner’s fundamentals (paddling, turning, etc.) and feel comfortable on a paddleboard. This is a more physically demanding class and will incorporate wave riding on the stand up paddleboard. We carry 12' Laird and 11' NSP Softop stand up boards, which are great for stand up paddlers of all levels! We also carry a variety of paddles in all sizes and heights. Lessons are conducted every day: 8:30 a.m., 10:00 a.m., 11:30 a.m., 1:30 p.m. and 3:00 p.m. All instructors are lifeguard/CPR certified AND are licensed by the State of Hawai'i. Lessons are one hour long and include 5-10 minutes of land and safety instruction.